The Cuba collection in rustic driftwood has a classic clean style that is open and airy, featuring rustic rattan poles bound with leather and upholstered seat cushions. The barstool with arms has a wide flat comfortable arm made of laminated rattan. The armless barstool can fi snug to a bar or counter to save space. 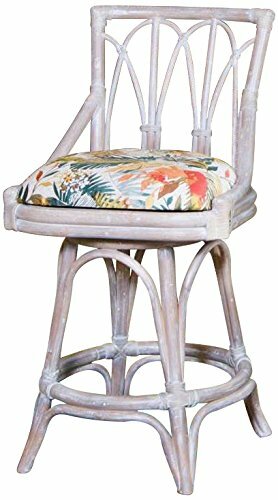 Hemingway would have enjoyed an ice cold daiquiri at el floridita perched one of these stools! the Cuba collection is also available in sienna finish. If you have any questions about this product by Alexander Sheridan, contact us by completing and submitting the form below. If you are looking for a specif part number, please include it with your message.